Okay, Celbi´s here for an update about our projects. Researching and writing a book is not an easy task. The first step was done at Didier Ghez´s place when he was living in São Paulo and working for Disney Brasil. The date? December, 14, 2003. The meeting had Didier, Fernando Ventura and I discussing all kind of Disney research/books we could work. Fernando has two books both still in work-in-progress. One is based on his monography for Belas Artes about Brazilian Disney artist Renato Canini and his interpretation of Jose Carioca and one about Disney Comics made in Brazil. The first book is really good but I must say I´m very impressed with all the plans for the second one about Disney comics made in Brazil. The chapter about Dickie Duck gang (turma da Pata Lee) is amazing! Fernando have a lot of in-depth information that would make Disney fans - not only brazilians - to smile in joy! I think it will be the Bible for those wanting to research Disney comics history in Brazil and a huge useful source for Disney historians worldwide. Well, I also hope my book to serve as source for Disney historians worldwide. 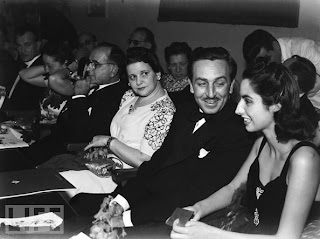 My book is about Walt Disney´s trip to South America during the 1941 Good Neighbor tour, at the request of the United States government. The book also have stories of Brazilian pionners influenced in some way by Walt Disney like Victor Civita (founder of Editora Abril), Herbert Richers (dubbing pionner) and Elcan Diesendruck (first representative). Aside from the diplomatic tasks it´s great to find fun stories of Walt (and the El Groupo) meeting all kind of Brazilian artists and political leaders. For instance I like how Walt got to know the music "Brazil" (Aquarela do Brasil) and the meetings with composer Ary Barroso. And there is also a story of Walt visiting a Samba school. The original plan had Walt visiting Portela to see a Samba dancing presentation for only a few moments but he liked so much that spent hours there. As you probably know the Brazilian government at that time didn´t like the idea to show the so called "african inspired" samba to the Disney crew. In the end this was one of the highlights for the touring group. The bulk of the book was done in 2007 but since then in a slow pace I am adding more information, reading more books and looking for new documents like the amazing pictures from LIFE photographer Hart Preston. I would like to notice the help from J.B. Kaufman´s book (South of the Border with Disney) and the upcoming DVD "Walt and El Group" documentary made by Ted Thomas. Both will help fill some possible gaps in my research. I am looking forward to finally release the book in 2011 - not only to celebrate 70 years of the trip but also 60 years of Zé (Joe) Carioca comic book in Brazil. It has been a long journey since 2003 but I can assure our readers and Disney fans...the books if released as planned will not disappoint any enthusiast or a serious Disney historian. You will find stories never before published.